Pools of water are a common feature of the landscape of the Mesoamerican world, especially in the land of the Maya. 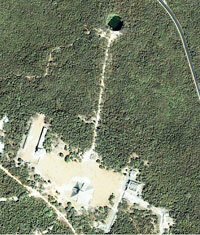 Many of these pools are sinkholes in the earth filled with water, which are called cenotes (se-no-tayz). The word cenote comes from the Mayan word dzonot, meaning “well.” These cenotes can vary in both diameter and depth, where the diameter can measure anywhere from several meters to a hundred meters or more (Pic 1). The depth can be just as variable, where some are only a few meters deep while others can be filled with 50 or more meters of water. Because the water that fills the cenotes comes from deep underground, the water is very clear and pure. This geological phenomenon is much more common in the Maya area (the Yucatan peninsula) than it is in the land of the Aztec in the Valley of Mexico, but although the geology of the two areas is somewhat different, much of the symbolism and gods associated with bodies of water is quite similar between the two locations. The reason that Mesoamerica has cenotes while many other places do not is because the entire area lies on limestone bedrock. When limestone is combined with water, the water erodes passageways throughout the stone, creating a Swiss-cheese effect underground. The result is that in certain spots near the surface, the eroded limestone will collapse and form a large hole. 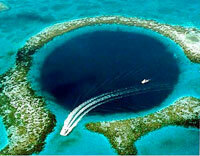 This hole is often deep enough to go below the water table, and a cenote is formed. Because cenotes form by collapsing stone, their sides are often sheer (straight up and down). 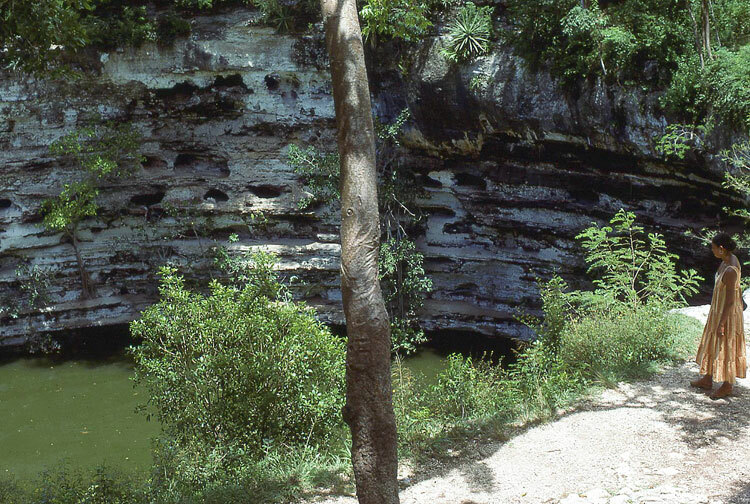 The water-eroded limestone also creates many caves in the area. The ancient Maya saw very little difference between cenotes and caves, and the same hieroglyphic sign could be used for each (Pic 2). Most cenotes were valued as a water source for local cities or towns, especially in areas far from rivers. 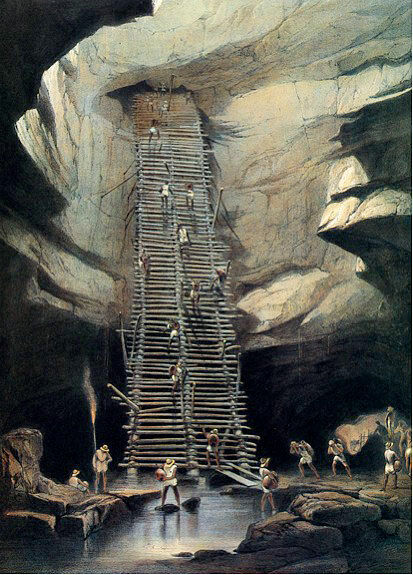 People would build a path or ladder at the edge of the cenote in order to collect water using large ceramic jars (Pic 3). Cenotes also had a symbolic use, as the ancient Maya regarded cenotes as one of the three symbolic entryways to Xibalba (shi-bal-bah), the Maya underworld. The other two entryways are caves and the ballcourt where the Maya ballgame was played. Because cenotes were viewed in this sacred way, the ancient Maya would throw offerings into these pools to communicate with gods and ancestors. They would also plan pilgrimages to special cenotes in order to conduct rituals and collect water, which was viewed as sacred. There is even evidence that a “cenote cult” was prominent during the Late Classic period (AD 600-900), just before the Maya collapse of the ninth and tenth centuries. This may have been a response to degrading environmental conditions, where periods of drought were making farming more difficult and even impossible in certain locations. The cenote cult would have conducted rituals at the cenotes to supplicate [pray to the water deities and guarantee a bountiful harvest. The most famous cenote is the “Sacred Cenote” at the Maya site of Chichén Itzá, located in the state of Yucatan, Mexico (Pic 4). Chichén Itzá dates from the Late/Terminal Classic period of Maya prehistory (circa A.D. 800), to the end of the Early Postclassic (circa A.D. 1250). The Sacred Cenote was a pilgrimage destination for many centuries, and has yielded large quantities of artifacts (and human remains) that were offered to the cenote by the ancient Maya people who practiced rituals there. The Sacred Cenote (sometimes referred to as the “Well of Sacrifice” or the “Cenote of Sacrifice”) is approximately 60 meters in diameter and only about 13 meters deep, but the water table lies over 20 meters down the sheer-sided limestone wall that forms the cenote (Pics 5, 6), and there is a small building on the southern edge. Stories of young virgins being sacrificed at the cenote to appease the gods are common, but recent archaeological analysis of the human remains found in the Sacred Cenote show that most of the individuals were male. Because cenotes were so central to the life of the Maya (especially in the northern Yucatan), many of their qualities are seen in art, symbolism, and belief. Several Maya gods are intertwined with cenote symbolism. The most prominent of whom is Chac, the Rain God. One of the oldest known gods in Mesoamerica, with more representations in the codices than any other god, Chac also has an Aztec counterpart (Tlaloc) in Central Mexico. The Rain God is characterized by a long nose, and at times has a snake protruding from his mouth. Chac is linked to lightning, with serpents and stone axes as common symbols of his control of lightning. 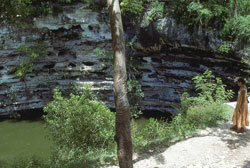 Because of his association with rain, Chac is also prominent in the rain cycle, which includes caves. Thus, Chac is sometimes depicted in cave or cenote settings (Pic 7). The Water Lily Serpent and Chac Chel are two other Maya gods often associated with cenotes and water. Whereas Chac embodies water from the sky (rain), the Water Lily Serpent can be seen as a symbol of water on the ground (such as rivers, lakes, cenotes, and the sea), and may also symbolically float between the world of the living and the dead (Pic 8). 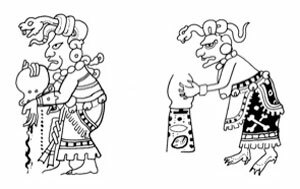 Chac Chel is shown in Maya drawings as an aged woman with clawed hands and feet and a snake headdress (Pic 9). Associated with storms, floods, and other powerful aspects of water, Chac Chel may seem to be a deity to be feared, but at the same time she is also associated with the positive aspects of medicine, divination, and childbirth. Chac Chel is often depicted pouring water from a jar, an act indicative of bringing rain, but also floods. Like Chac, Chac Chel is often depicted in association with caves. The Maya used the importance of cenotes as a basis for some of their most powerful and important imagery and symbolism. 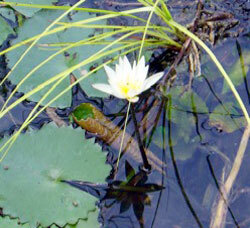 Water lilies are often seen growing on the edges of cenotes, and when they are present they signal that the water is relatively clean (Pic 10). A signal for clean water was very important in the Maya area, because even though the Maya lived in an area called the rainforest, there are several months out of the year (in the spring), where it almost never rains. Clean water would have been a very important commodity during the dry season, and the signaling feature of the water lily was understandably important. The water lily is a very common motif in Maya imagery, as already seen in the Water Lily Monster. 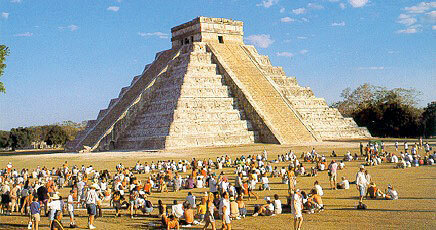 It is also used as the hieroglyphic symbol for the first day name in the Maya calendar. Cenotes are still important for the modern Maya in villages where water is not available from any other source. Pilgrimages and rituals are still practiced in some of these areas today in much the same way that they would have been a thousand years ago. There is one additional cenote that is of note for its unique location. Although probably not of importance to the ancient Maya, the great “Blue Hole” in the Caribbean Sea off the coast of Belize is an underwater cenote that is now a famous scuba diving spot (Pic 11). The very deep water lures large underwater creatures that would not necessarily live in the surrounding shallower areas. In sum, cenotes were important to the Maya from the earliest times until the present, both as water sources and as places charged with symbolic meaning. The variety of water symbolism and gods associated with cenotes shows us that the ancient Maya viewed water ritual as central to their belief system, and practiced their rituals at specific areas like cenotes where underworld connections would be the most potent. Cenotes were important enough that pilgrimages to their locations were warranted, and at certain times in history water ritual was so vital that religious splinter groups (cults) spent all their focus on this one area. • Andrews, Anthony P., and Robert Corletta 1995 A Brief History of Underwater Archaeology in the Maya Area. Ancient Mesoamerica 6: 101-117. • Ishihara, Reiko, Karl A. Taube, and Jaime J. Awe 2006 The Water Lily Serpent Stucco Masks at Caracol, Belize. Research Reports in Belizean Archaeology 3:213-223. • Kinkella, Andrew 2009 Draw of the Sacred Water: An Archaeological Survey of the Ancient Maya Settlement at the Cara Blanca Pools, Belize. Unpublished PhD Dissertation, University of California, Riverside. • Miller, Mary, and Karl Taube 1993 The Gods and Symbols of Ancient Mexico and the Maya. Thames and Hudson, London. • Moyes, Holley, Jaime J. Awe, George A. Brook, and James W. Webster 2009 The Ancient Maya Drought Cult: Late Classic Cave Use in Belize. Latin American Antiquity 20(1):175-206. • Robertson, Merle Green 1990 The Celestial God of Number 13. Triptych September/October: 26-31. • Sharer, Robert J., and Loa P. Traxler 2006 The Ancient Maya, 6th edition. Stanford University Press, Stanford. • Stone, Andrea 1995 Images from the Underworld: Naj Tunich and the Tradition of Maya Cave Painting. University of Texas Press, Austin. • Taube, Karl A. 1992 The Major Gods of Ancient Yucatan. Studies in Pre-Columbian Art and Archaeology, Number 32. Dumbarton Oaks, Washington D.C.
Pic 8, water lily serpent, is widely used, but I estimate that one original source is my PhD dissertation, and ADEVA, Graz, coffee table book version, 1987, Monster und Menschen in der MayaKunst. But your bibliography is nonetheless pretty good.